In Amsterdam (and now in two other Dutch cities), it’s easy and lovely to eat a fine meal and also help the planet. At Instock Restaurant in the Oosterpark neighborhood just outside the historic canal belt, food waste is turned into creative cuisine. Think ugly but perfectly edible fruits and vegetables, one-day-old bread, bycatch fish, and excess production of beef and pork. Collecting this food that would otherwise be thrown out from supermarkets, food producers, packagers, and other sources, they bring it back to their kitchens. By noon each day, the chefs have looked over the day’s haul and decided on that night’s set menu. The aim of the business is to reduce food waste and create awareness around this complex issue. But what good is rescuing otherwise wasted food if no one wants to eat it? Don’t make the mistake of comparing this to the leftovers you force yourself to eat from your fridge but really hate. The food at Instock is good, really good. It can compare with some of the best in the city. Because head chef Lucas Jeffries and his team never know precisely what ingredients they’ll have to work with from one day to the next, they have to be more creative, more innovative, and definitely on their toes to satisfy their customers. And satisfy they do. Both their customers and the planet win. Location: Czaar Pieterstraat 21, Amsterdam Oost. The restaurant is very near the #10 tram line. Menu: It’s difficult to describe the menu at Instock, because it changes daily. The creations from the kitchen depend entirely on what rescued food items make their way to the kitchen that day. But the dishes are always creative, modern, and well done. There are some standards at breakfast and lunch, like omelets, their special house granola, and various house-preserved and fermented foods. The set four-course dinner always features a soup or other starter, a main dish, a creative side, and a luscious dessert. There is always a vegetarian option for each course. 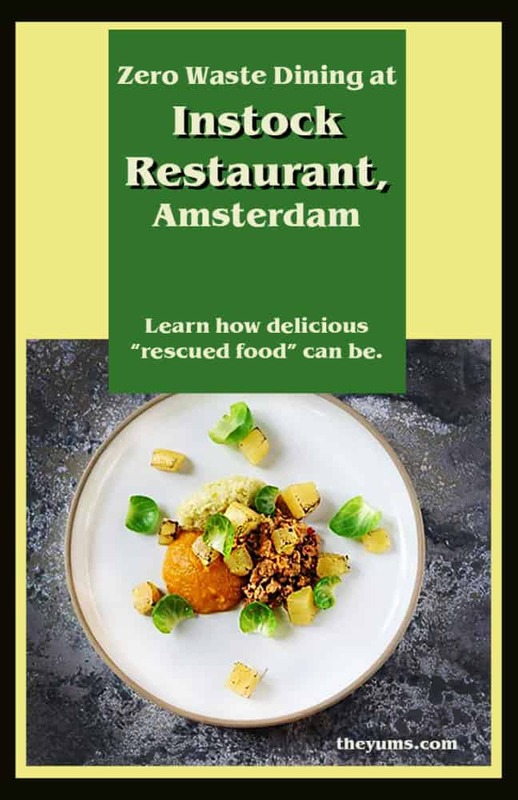 Dishes on the menu are created with a minimum of 80% “rescued” food. There are often special theme series menus: i.e. a Russian week featuring blinis and borscht, an Italian night, or an Asian fusion menu with a twist. Thoughts: Here is a harsh truth: More than one-third of all food produced globally is wasted. This is food that costs millions of dollars in resources to produce, including massive amounts of precious water, and emits huge clouds of greenhouse gases when it ends up in landfills and garbage piles. A few years ago, three friends working together at the Albert Heijn supermarket chain (the largest in the Netherlands), decided they wanted to do something about the problem. They knew that a bruised apple makes applesauce as tasty as an unblemished one, that a gnarly two-legged carrot tastes the same as a perfect orange cone one. They convinced the grocery chain to give them their unsalable produce and other goods close to their “sell by” date but still perfectly fresh and edible. Then they set out to prove that this “rescued” food could be turned into delicious meals instead of going into the dumpster. For several years now, they have continued to prove the concept works. Every morning beginning at dawn, an electric-powered vehicle crisscrosses the city to Albert Heijn stores and its distribution center, meat packagers, fish markets, and other food outlets to pick up blemished fruits and ugly veggies, discontinued branded goods, surplus meat, crooked fish, mislabeled wine, overstocked chocolate, cheese, and tofu. Back in the kitchens, the chefs get to looking and pondering. If the truck is loaded with a glut of very ripe bananas, you’re likely to find banana ice cream featured on the night’s dessert list. Piles of eggplants today? Look for eggplant caviar, a mousse of eggplant in a pool of paprika coulis and green herb oil topped with crisp crackers and cured egg yolk shavings. If ‘tis the season for “witloof,” or Dutch chicory, look for a spread of the vegetable grilled, oven-dried, and poached in wine and honey. Perhaps the day yielded up a few crates of broccoli stems, the most frequently wasted vegetable part in the market. Diners will enjoy the light and tasty broccoli mousse it yields through the talented hands of the Instock chefs. Some other creative dishes often on the Instock menu might include a breakfast plate of a waffle topped with caramel foam, roasted banana, chopped strawberries and a dusting of powdered sugar or bruschetta with zucchini three ways—grilled, fresh in a salad, and sweet and sour—all topped with mustard foam. Or maybe today will offer Tartare de Merluzzo, made with the cut-offs of cod not pretty enough to be sold but full of flavor and served with a lemon-vanilla dressing and chips. Or Nduja, made with a local sausage and a sauce of fermented chili peppers, pumpkin puree, roasted pumpkin and sprout pesto. And if a dish features fresh ricotta, it’s likely been made with leftover steamed milk from their own barista. And then there is the beer. In an attempt to rescue even more food, the creators of Instock started talking to brewers in this country famous for its beers. Knowing that the country wasted some 340 million kilos of potatoes every year—due to overproduction, overly strict quality requirements and aesthetic standards—they wondered if all those spuds could be turned into brew. Yes, indeed, they could, and the result is Instock’s Pieperbier. It’s a hoppy beer with a floral bitter taste similar to Pale Ale. Not content with their potato rescue, they discovered that 20% of all bread production in the country is wasted. So… bread beer? Yep. Bammetjes Bier has a light yeasty taste, like a weizen or wheat beer. And for every glass of bread beer you drink, you’ve rescued two slices of otherwise wasted bread. The foundation’s commitment to sustainability goes beyond just the food that ends up on your plate. They serve only Fair Chain and Direct Trade coffee and tea. The leftovers from the kitchen are recycled in staff meals or sent to be made into biogas. Employees wear clothing made of recycled cotton. They buy only green energy. The charming décor is made of recovered doors and windows, repurposed tables, and upcycled items. The room is bright and airy, with large windows and soft pastel colors. There is also a sunny terrace very popular with locals. The employees at Instock share in the owners’ passion for sustainability. With friendly service and deep knowledge, the wait staff will happily explain the restaurant’s mission as well as the details of the day’s dishes. Price Range: At dinner, the four-course set meal at Instock costs €31 (at this writing, about US$35.50). You can also order a single dish for €8.90. At breakfast, a plate of French toast with banana and dulce de leche is €5, a veggie and cheese omelet is €7. If you can’t make up your mind what you want for lunch, the Chef’s Special is €10 and includes all the chef’s sweet and savory specials of the day. Soup of the day is €6.50. A fish burrito made with “crooked fish” of the day is €7.70. The mixed salad, which is a meal of grilled vegetables and fermented tomatoes costs €9. A glass of the house-brewed pieper bier or bammetjes bier is €4.20. Rescued wine, from discontinued lines or incorrectly labeled bottles, ranges from €3.95-5.75 per glass or €19-31 per bottle. IMPORTANT NOTE: Like many restaurants in Amsterdam, Instock does NOT accept cash payment. Only credit and debit cards with a chip are accepted.